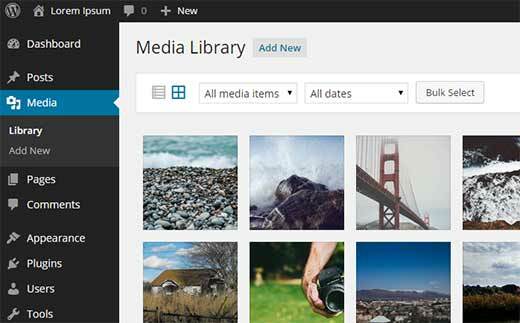 Do you want to download all images and media files from your WordPress media library? You can use a FTP client, but that’s not easy for beginners. In this article, we will show you how to download your WordPress media library without using FTP. First thing you need to do is install and activate downML – Download Media Library plugin. Upon activation, you will notice a new menu item in your WordPress admin bar labeled ‘downML’. You need to click on the menu which will prepare a zip file of your WordPress uploads directory and make it available for download. When your download is ready, you will see a page with the link to medialibrary.zip file. You can download this file to your computer. After downloading the file to your computer, you can extract it to get your entire WordPress media library. 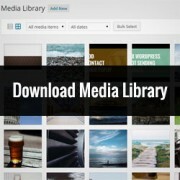 Why & Who Would Want to Download the Media Library? If you want to store a copy of just your media library in your computer, then this plugin is handy. You can always use a fully automated WordPress backup solution, and it will backup your entire WordPress site (including plugins, themes, posts, and the media library). However, most backup plugins do not have an easy way to download just your uploads and media library. This plugin provides a much quicker way to do that. Another way to download your files is by using an FTP client, but if the user does not have access to the FTP or don’t know how to use it, then this plugin is an easier alternative. We hope this article helped you download your WordPress media library. You may also want to see our tutorial on how to connect Google Drive to your WordPress media library. so why don’t people use the built in import/export tool from WP ? why use a plugin when functionality is already there ? This plugin no longer exists. I also had problems with this plugin. The website for it is no longer alive, and the email contact offered bounced back. I have used WP File Manager to do this successfully, although it takes more steps. All-in-One WP Migration also lets you choose to only capture media files. Am I not able to do this without purchasing a business plan? I have a huge media library of 680 MB and the downml plugin displays an error. Is there a way to override tis or is there a plugin that can do this? So how do you import them and have it show up in the database? What plugin do you use for that? I tried this but it says my file is too big. Is there a way to select just some of the pictures? Hi , My wordpress media library having 771 files while exporting media library using downML plugin error occurs as – Media Library contains 771 files in excess of 174.46 MiB…Now how i export my media files is any other plugins there if anyone know the solution please let me know thanks in advance.. Thank you so much!!! You saved me a ton of time and effort!!!! We are glad you found it helpful. How do i download the images included in the Home slider Only? Thanks for the article. Does anyone know if I can download my entire media gallery via ftp, optimise all photos on my PC and then re-upload without messing up the site? I’ve tried using some WP plugins for optimisation of photos, but I’m still not entirely happy with the result, so I’d like to do them on my PC. But then, I’d like to avoid having to edit all posts and pages in order to add the photos again. Just used the downML plugin after reading this post. The good news: it worked… the bad news, the zip folder is just the files i.e. it removes the folder path structure. If you need to quickly move things FTP or a better clone plugin is best. Please do you know of a way to download the Media Library from a WP.COM install?? It is crazy they say to do it manually. Thank you, I did’n know about plugin. I always download ML in old way via FTP.